The mighty German Kingtiger tank has always been immensely popular with modelers, so Dragon is offering another variant from the ‘big cat’ family. It’s a 1/35 scale kit of a Kingtiger with a Henschel turret. It’s also specially configured to represent a tank fighting in the Ardennes in 1944-45, when Germany launched a major counteroffensive that became known as the Battle of the Bulge. While this 1/35 scale kit is a refined version of what has been available before, a key change is the unique Kgs 73/800/152 tracks. The running gear also comes with appropriate 18-tooth drive sprockets matching the tracks. The Kingtiger’s turret and upper hull have also been slightly refined as well. Additionally, there is a generous array of photo-etched partss. 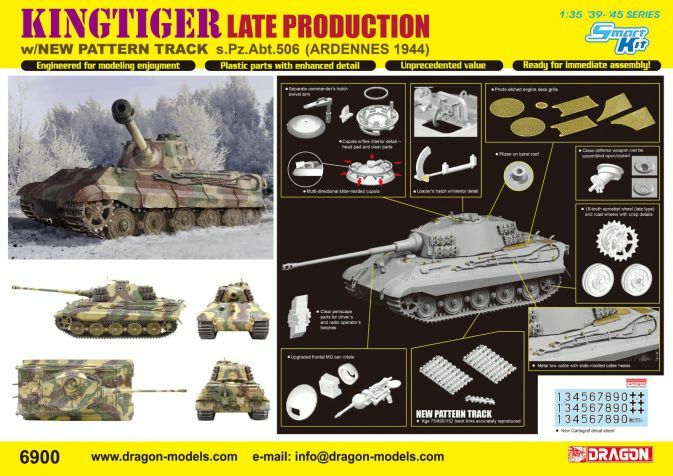 This kit thus offers a convenient way for modelers to create a Kingtiger ready to thunder through the wintry Ardennes forest.